Lamar Jackson is the most compelling player in dynasty fantasy football formats. He was the No. 5 fantasy quarterback from Week 11 when he made his first start through the end of the regular season, an accomplishment he owes primarily to his average of 17 carries, 79 rushing yards, and 0.57 rushing touchdowns per game. But Jackson is small for a volume runner at 6-2 and 212 pounds, and the Chargers’ ability to limit his and the Ravens’ rushing attack in their second crack against them Wild Card weekend could be a harbinger of a fantasy decline as teams see and study his tendencies. With those specific pros and cons, Jackson seems destined either for consistent top-five finishes or for a total lack of future value. What follows isn’t about Jackson’s long-term prospects. It’s about his short-term disruption of a mathematical projection and ranking system. The one such weekly system I produced and ran for the 2018 season worked well for most players and teams. Take for instance the Chargers. Their actual totals of pass and run plays jumped around from week to week, but they sawtoothed around a consistent trajectory that my projections could follow. Joe Flacco’s Ravens did that, and Jackson’s did as well, but their two tendencies look totally disjointed when combined to show the team’s full season. I already mentioned that Jackson took over in Week 11, but that would have been an easy guess after a glance at the play charts. It’s subtle, but my pass and run play projections started to decrease and increase, respectively, after Jackson disrupted the team’s tendencies. 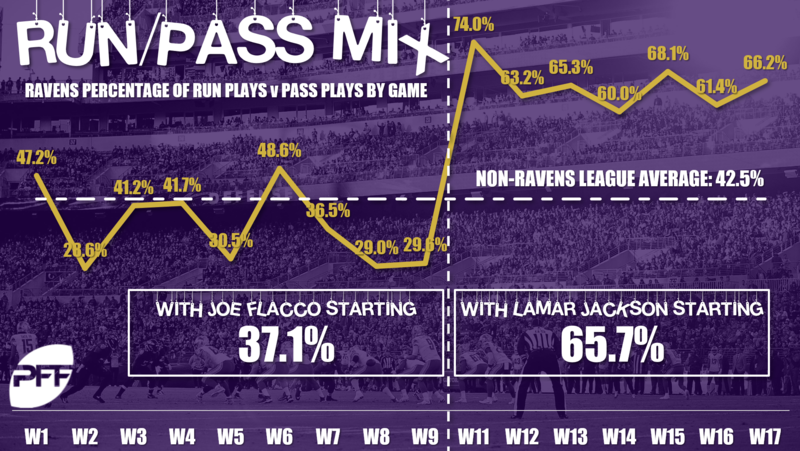 They just couldn’t catch up since they relied on the Ravens’ pass and run tendencies from recent seasons, and those were more heavily weighted to Flacco starts since he has been the team’s primary starter from most of those games. My original research on team pace showed that both quarterbacks and head coaches exert similar influence on the continuity of team pass and run snaps, and so my projection and ranking system used a team’s entire sample of plays if either actor stayed in place. But most quarterbacks fall into the pocket passer bin. Jimmy Garoppolo and Nick Mullens each ran fewer than three times per game, and so Kyle Shanahan’s 49ers followed a similar offensive strategy no matter their quarterback starter. Flacco’s and Jackson’s strengths and weaknesses are so different that they demand different approaches, and that would undoubtedly be true with John Harbaugh or anyone else as their coach. I made a small tweak to my pass and run play projection methodology to project from quarterback-coach duos. The resulting projections did not change for many teams, but they could now more easily catch up to overhauls to the pass and run pace of teams that transitioned between pocket passers and dual threat quarterbacks. My Ravens projections, for example, shifted more than 10 pass plays to run plays after just one week of Jackson as the starter. Jackson may not maintain his extreme run tendencies in future seasons, as much because of the development of his passing game as any desire to preserve his health and keep opponents off balance. With his potential for more dramatic change and with this becoming more of a football-wide issue with the recent preponderance of dual threat quarterbacks, it’s critical for team play projections to hold some sensitivity to roster-driven strategic changes. After all, this isn’t just about Jackson’s rankings. The accuracy of every Ravens’ skill player’s rankings depends on realistic forecasts of the team’s pass and run plays.